We are loving our holiday themes this year. Our reindeer theme was a fun way to get in the holiday spirit without going all santa and elves and even do a little nonfiction learning. 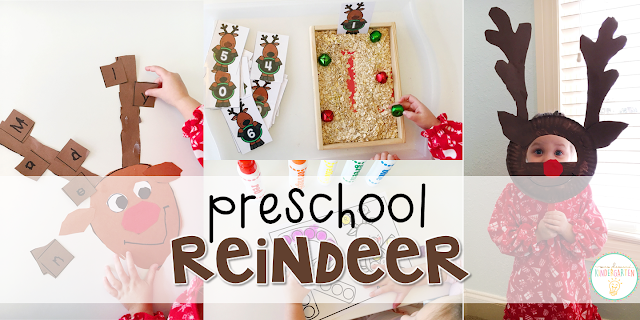 Check out this week full of all kinds of reindeer themed learning and fun! Our first story was Olive, the Other Reindeer, by Vivian Walsh and J. Otto Seibold. We started by reading the story. After reading I gave Madelynn a response page divided into 3 columns for beginning, middle, and end. We talked about what happened in the story then Madelynn drew a picture to show each part. Afterwards I asked her to tell me about each picture/part of the story. Beginning: He was listening to music. Middle: He went with the reindeer to help. End: They were at the North Pole and opened presents. Our next story was The Great Reindeer Rebellion by Lisa Trumbauer. Before reading we discussed and defined problem. We talked about how every story usually has a problem or something that goes wrong. After reading, Madelynn drew and labeled the problem in the story (Santa’s reindeer wouldn’t fly the sleigh.) Then we talked about how the problem was solved. Our next story was The Wild Christmas Reindeer by Jan Brett. Before reading, we practiced answering questions and making predictions. She is still making very basic predictions initially, but I love that she is starting to use the vocabulary that we have been talking about each week, like characters. For some nonfiction learning, we read Reindeer (A Day in the Life…Series) by Katie Marsico. While reading I used picture cards to reinforce new words. Then Madelynn made a reindeer vocabulary book. She drew pictures to show the meaning of each word and used the picture cards and book as a reference. Next, for more letter practice we used our dot stampers. We started out stamping inside the letter to make an R for reindeer. Then Madelynn had to find the upper and lowercase r’s in Rudolph, stamp them and make the “R” sound each time. This week we focused on rhyme again. 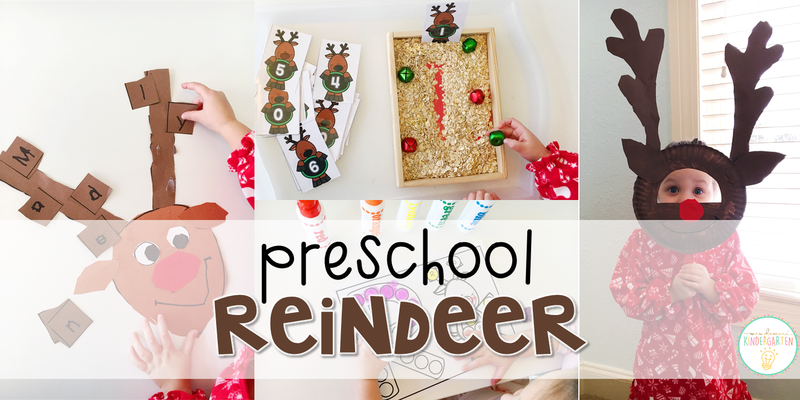 For this rhyme sort, I taped reindeer feed bag labels onto small paper bags with pictures and printed carrots with rhyming pictures. First we read the word on each carrot, Madelynn found the rhyming word then placed it in the correct feed bag. Afterwards we brought them to our stuffed Sven (the reindeer from Frozen) for a little snack. For this week’s name craft we created this fun reindeer. First Madelynn cut the reindeer pieces out. Then she traced the letters in her name on each antler piece. After she finished writing, she glued the reindeer pieces together and added the antler pieces in order to spell her name. To finish off the reindeer she used a marker to draw a mouth. For our journal this week Madelynn chose to draw and label a reindeer habitat. She decided that her reindeer lived in a cave because that is what she saw in Rudolph. After drawing she wrote Rudolph next to her reindeer with “RF.” All the letter sound work and stretching out words is starting to show! Our first math activity this week was a reindeer themed writing tray. I filled the tray with oats and sprinkled with glitter. Then Madelynn used small reindeer number cards as a model to write numbers in the oats with jingle bells or her finger. It’s starting to get a bit cold to be outside for long so it’s time to incorporate a little movement into our learning inside for sure. For this shape game Madelynn put on reindeer antlers and chose a shape reindeer card from our basket. Then I called out an action and she ran, jumped, tiptoed, hopped on one foot, and flew like a reindeer across the room to find the matching shape carrot in a basket. She named the shape then fed it to her matching reindeer. Learning shapes was fun with this little shape reindeer. To make this activity more about shapes and less about cutting, I precut the reindeer shape pieces from construction paper. I also didn’t want her cutting skills to interfere with her ability to identify each shape. (The circles sometimes turn into squares and triangles into trapezoids depending on her cutting ability that day.) I named a shape to find. Madelynn looked for it then followed directions to glue the pieces together and create a reindeer. These shape reindeer were just too cute, so I had to find another way to use them. I created these little Rudolph shape puzzles. Madelynn matched the shape pieces together. Then I helped her read the shape words and match them to the puzzles. We can never have enough counting practice so I came up with this little game for Madelynn to get some more practice in this week. First I printed the reindeer (without antlers) page. Madelynn rolled 1 or 2 dice. Then she counted out the correct number of brown connecting cubes and used them to build antlers for the reindeer. These little rockets were hands down our favorite activity of the week. I printed black and white reindeer and Madelynn colored them in. I cut a few inches of length off 4 plastic pipettes and taped them to the back of each reindeer. Madelynn pushed a straw inside of the pipette on the first reindeer. Then she blew in each one to see how far she could launch it. After she repeat with each reindeer we talked about which one went the furthest.